Nero di Troia (also called ‘Uva di Troia’) is the third most important of Puglia’s native balck grape vines, after Negroamaro and Primitivo, and its production is concentrated near Foggia and in the northern part of the province of Bari, where the Rivera winery is located (Andria). High in tannins and very late in ripening, the grape is tough to grow and was traditionally relegated almost exclusively to blended wines (Rivera’s Il Falcone is one of the best examples, a blend of mostly Nero di Troia with 30% montepulciano). More recently, by reducing yields and keeping maceration short, winemakers are able to keep the tannins in check and creating very succesful bottlings of single-variety Nero di Troia. 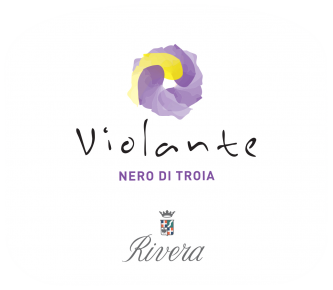 Violante is the result of Rivera’s wish to marry Nero di Troia’s classic complexity and marked scent of violets to a crisp fruitiness and early approachability. The grapes are harvested in the second half of October and are vinified with a short maceration on the skins at low temperature, careful pump-overs, micro-oxygenation and delestage to ensure the extraction of the aromatic and color components, without exceeding in tannin content. Aged for 12 months in glass-lined concrete vats , then 3 months in bottle prior to release. The resulting wine is luminous purple-red, with a rich bouquet of wild red berry fruit and notes of sweet violet. Juicy, full-bodied palate, with fine balance between fruit and structure. Enjoy at cool room temperature by itself or in combination with soups, pasta sauces and meats. Violante is also the ideal partner for the famous Burrata di Andria. Spurred cordon system. Yield is kept as low as 110 quintals per hectare. Harvest is carried out in the 2nd week of October (late-ripening varietal). A 9/10-day maceration in stainless steel vats with careful pump-overs, micro-oxygenation and delestage ensures the extraction of aromatic and color components, without exceeding in tannin content. 12 months in glass-lined concrete vats. 3 months in bottle.